Are We Still Friends? After This Event, I Hope So! 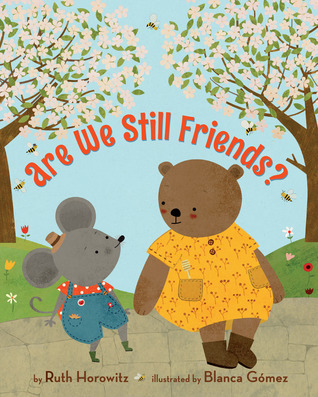 When picture book author Ruth Horowitz (Are We Still Friends?) contacted us last fall for an author event in March, we wavered. March was shaping up to be a crowded month with several offsite events planned, and we wanted Ruth to have a successful reading. Since Ruth was sure she could help draw a crowd, and we like to say yes if we can, we did. And boy, were we happy we said yes! Little did we know how much of a crowd Ruth would gather. Ruth has lots of local connections, having once lived and worked in Vermont. She was sure her friends and colleagues would turn out, got in touch beforehand to warn us that she’d run out of books at a previous event. We’d ordered 30 copies from Scholastic and another 10 from a distributor, so we felt comfortable. Authors—optimists that they/we are—tend to overestimate how many books will sell during an event, sometimes by a lot. They also aren’t usually aware that the cost of returning unsold stock can make a bookstore actually lose money on an event. Forty books is a solid number for most regular events, and we’d also brought in Ruth’s backlist. But we hadn’t counted on Ruth’s extraordinary powers to bring in her people. Usually, authors estimate how many of their friends and family will attend an event, and the actual numbers generally turn out to be about 1/3 to 1/2 of the guess. Weather, unexpected illness, forgotten appointments, and busy lives can conspire to keep people away at the last minute. 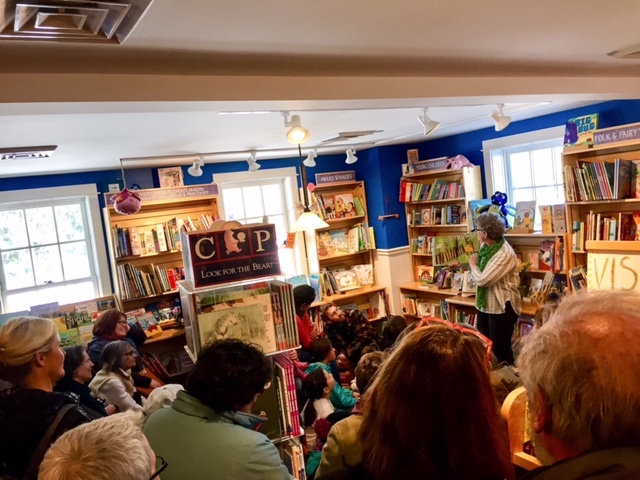 But our last two events with authors with VT connections have been spot on! Jason Chin and Ruth Horowitz both drew terrific crowds, made up of the public as well as personal friends. But Ruth’s event was, I think, the first in my 20 years of bookselling where the author brought in even more of her own invitees than she expected. It was a delightful event, full of warmth and good feeling—and worth all of the store fixture rearranging we’d done to accommodate the crowd. (We have to get creative with larger audiences!) I just love it when the bookstore is filled with laughter and book joy. The theme of Ruth’s picture book — salvaging a friendship after an unhappy incident — resonated with listeners young and old. Ruth had brought apples and honey sticks, and we’d brought honey teddy bear cookies, so younger kids went outside to the snack table while Ruth signed and chatted with the adults waiting in line. It was a crazy scene, but a really fun, relaxed kind of crazy. In the end, we’d done a pretty good job of predicting book numbers, or at least would have done if five of the copies hadn’t arrived damaged. At the end of the day, we were four copies short. We had Ruth sign bookplates for those copies and for a new stack of stock for the store’s shelves. All in all, it was the best incarnation of a happy bookstore event for a local — well, used-to-be-local — author! This entry was posted in Uncategorized on March 21, 2017 by Elizabeth Bluemle. That was always the most frustrating part of events for me: author overestimation. Of course, having an author coming in and doing an event was great 98% of the time, so I’d gladly have dealt with that frustration in nearly ever case. Glad to hear this event in particular went well! What a wonderful event! And what a warm, welcoming, well-organized, flexible and supportive bookstore staff! Your happy willingness to make it all work made all the difference. Thank you!